Elia and onepoint are seeking to increase public acceptance of the electricity grid. Ever dreamed of working with one of Europe’s leading power system operators? Then Elia might offer what you are looking for! We need your very best unconventional or even counterintuitive ideas for improving public acceptance of power grid infrastructure projects. Once selected, you’ll get the opportunity to work on a joint project together with Elia and 0nepoint, a leading consultancy specialised in transformation and digital solutions. You’ll contribute to society by clearly demonstrating the relevance and added value of grid projects for the benefit of the community. Not really convinced? Maybe you might have more affinity with stakeholder involvement, communication or even virtual reality? Then we also have a match! Reshape your idea, think outside the box and come up with a brilliant solution that brings us and our story closer to a successful solution. Has your startup developed an innovative solution helping people to better understand the societal need for new project development and infrastructure construction? Then you have our full attention! Elia is looking for innovative solutions that can be incorporated into its current projects and future development plans. To that end, the company has launched a dedicated competition with a top prize of €20,000. To be eligible, your application must include the mandatory online form and a to-the-point PowerPoint presentation of maximum 10 slides. All startups are welcome! Whether you are a specialist in this field or you've just discovered the concept of public acceptance, show us your creativity and innovation potential. Startups that deliver solutions for involving stakeholders in the construction of new and old grid infrastructure. Not only improving dialogue, but also proactively identifying obstacles and obstructions within the community such as action groups, etc. Startups capable of better informing the public (demonstrating the benefits of construction, the positive impact on public, reassuring them about health and visual impacts, using augmented reality, etc.). Major infrastructure projects often generate numerous debates and frequently have trouble in terms of gaining acceptance by municipalities and obtaining the official required permits. This is especially true for projects involving overhead lines or underground cables, renewable energy infrastructure, gas pipelines, motorways, airports and hydroelectric power stations. Elia's mission is to develop the grid of the future in order to cope with the changing nature of electricity demand and production, thus contributing to Europe’s climate and energy targets for the year 2020 and beyond. Although electricity grid infrastructure (new and old) enables economic development and improves the well-being of the entire local community, it is no exception to the rule. Every project to develop or construct power lines results in citizens expressing concerns – and sometimes even fierce opposition. The issues raised – such as the impact on the landscape, noise and disturbance during the construction phase, fears about the health impact of electromagnetic fields, and so on – have a negative impact on the further development and timing of infrastructure projects. Or the Elia Life project that intends to promote biodiversity along electrical corridors in woody areas of Belgium and France. The final event will take place in Brussels, where Elia is headquartered. 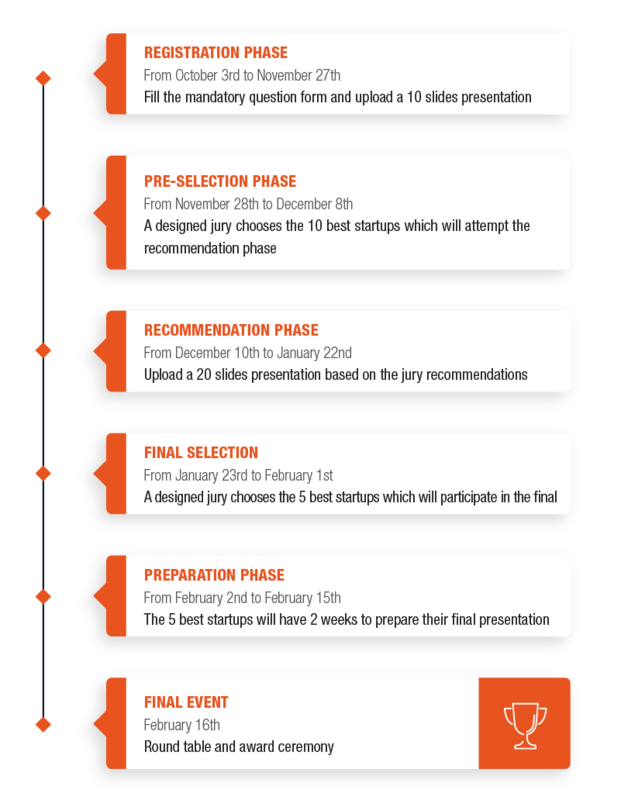 Pitches from finalists, award ceremony, celebrations. Elia is Belgium’s high-voltage transmission system operator (30 kV to 380 kV), operating over 8,000 km of overhead lines and underground cables throughout Belgium. Our company plays a crucial role in the community by transmitting electricity from its generation to distribution systems, which in turn deliver it to the consumer. Elia also plays an essential part in the economy, as our system supplies power directly to major companies connected to the grid. Boasting a pivotal location in Europe, Elia is also a key player in the energy market and the interconnected electricity system. Our company has set up multiple initiatives promoting the development of an efficient, transparent and fair electricity market for the benefit of consumers. Elia employs more than 1200 professionals in Belgium, who are not only committed to dealing with future challenges, but who also handle the day-to-day operation of a system considered to be one of the most reliable in Europe. In less than 15 years, onepoint, which now employs more than 2,000 people, has become a leading player in digital transformation. Onepoint’s mission is to both foresee change and lead it using the right tools for its private and public sector clients. Onepoint’s strength lies in maintaining its agility as an innovative mid-size company and building on its capacity to deliver tailored solutions to its clients through its strong relationships with startups and SMEs, while strengthening its sectoral and consulting expertise in leading change. Onepoint’s mission is to become a European leader in its field by helping companies develop their architecture, reflect on their organisation, and develop networks, systems and tools to increase their daily performance. Onepoint has grown into an international group present in north-Western Europe, Canada, the United States, Tunisia and China, while growing its production capacities in France. Onepoint is not only a fast growing company, fueled by the needs of its customers for consulting and digital services; it is also a catalyst for the entire digital economy.